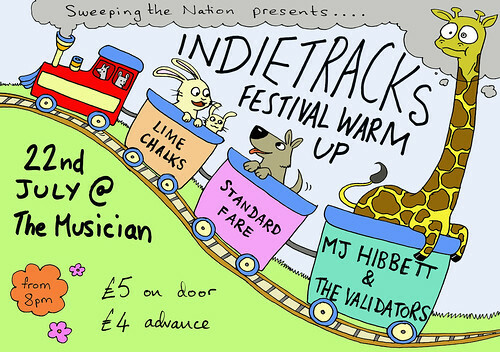 The only non-Indietracks full band public gig this year (we think) by the indiepop bard of Peterborough, just before he takes his one-man rock opera Dinosaur Planet to the Edinburgh Fringe. Some say they're indiepop's breakout band of the year. What we can definitely state is The Noyelle Beat is a superb work. Birmingham outfit who, they say, "play indiefolklofipop or whatever you'd care to call it, and their philosophy is thus: cheerfulness, melodiousness, harmoniousness!" As usual it'll be £4 online or £5 on the door. Register your interest on Facebook or last.fm, why not. We did this last year, but given the explosion in UK festivals is first said to have started leaking crucial fluids in 2007 it seems a good time to take stock. Hence, this table - this is how much a single adult camping ticket for pretty much every major festival in the land costs you now and would have cost you three years ago. Alright, so maybe yesterday's contributions didn't quite conclude matters, but this Super Furries cover is far too good to abandon to fate. Benjamin Shaw makes "songs of nausea, noise, love, desperation, hope and hilarious anecdote", EP I Got the Pox, The Pox Is What I Got seeing him baring his tortured soul in lo-fi recording and electronic subterfuge.